Voices Along the Skagit is divided into three parts. Part One, Learning From the Past, offers necessary background information to teaching Native American history in general, and Native history of the Skagit Watershed in particular. The Skagit Watershed includes the Skagit River and its tributaries, as well as the saltwater areas and islands near the river’s mouth, such as Skagit Bay, Swinomish Channel, Camano Island, Whidbey Island, and Fidalgo Island. Part Two, Living in the Modern World, presents the survival and continuity of tribal culture to the present day. Part Two also addresses social and educational issues that educators should consider before teaching Native American history and Native children. Most of the topics in this section are highly politicized, thorny and complex historical issues. However, precisely because they are so controversial, educators will want to learn how to respond with knowledge and sensitivity to questions that invariably arise when discussing these issues. Not only do we want to teach about Native American history, we also want to teach for Native children. Historically, public education has not been very successful in retaining Native students; we hope that we can help reverse this trend. 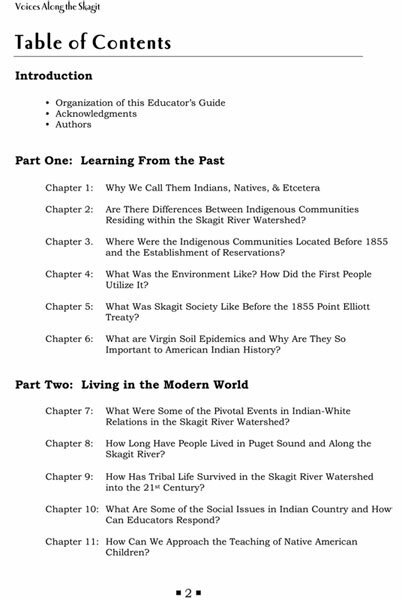 Part Three, the appendices, provides resources for the teacher, which include an annotated bibliography; a timeline for people of the Northwest Coast, Puget Sound, and Skagit Region; the poem “Salmon Boy” by David Wagoner; a transcription of the Point Elliott Treaty of 1855; a short story from the oral literature, “Lady Louse Cleans House”; several portraits of Native Americans living in the Skagit River Watershed; and a map of the River Skagit Watershed.